Hello folks - Edna Sweet here...nice to meet you. Yes, I am the Edna Sweet who runs the chain of Sweet Olde Tea Shoppes across England. I'm so pleased you like them. Of course, I started with one little place just outside Oxford, and now look at me! And to think it might never have happened. That first year I was trading...well, the things you overhear when people think you're pouring them a cuppa or toasting a teacake - you have no idea. I was shocked. When it comes to the perfect summer read - that allows you to relax and visit far-flung places with no effort - what's your cup of tea? A historic mystery set in old Shanghai? A hapless Scot on a visit to enigmatic Florence? How about an English country tea shop? Or a Welsh seaside city? Cathy Ace's MURDER KEEPS NO CALENDAR offers escapes to all these places, and more. 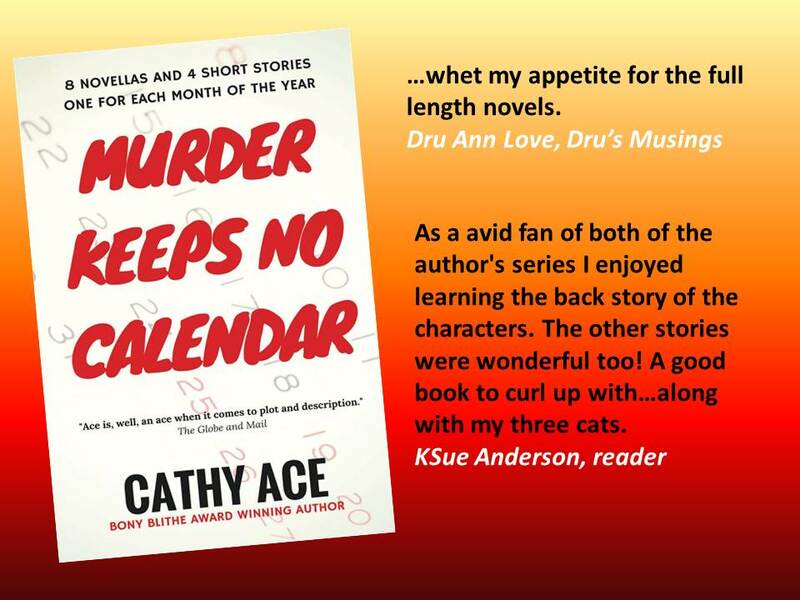 Whether you know this award-winning author's Cait Morgan Mysteries and WISE Enquiries Agency Mysteries, or not, you're in for a treat with this book. Comment below, and leave an email address, to be entered to win a copy of the anthology where both her series begin. Closes midnight Eastern 23rd July. Open to those who live anywhere in the world! This sounds wonderful. Thank you. I enjoy short stories for that reason as well. Great for in between times. I haven't read anything by this author, so this would be the perfect beginning. This sounds like a really fun read. I love Cathy Ace's series. Thanks for the chance to win. This sounds like a good mix of stories. I enjoy all types/settings of mysteries. The next one I read just depends on what I'm in the mood for at the moment. This sounds great! Thanks for sharing. Cathy is a new author to me. I really like discovering new cozy authors. The anthology sounds like a good way to start her series. Love learning more about the characters in the Cait Morgan and WISE Enquiries Agency Mystery series. Have added this series to my to do.list!! !Good and mystery, great combo!!! This is a new author to me and this sounds like a good way to get to know her.Thanks for a chance to win. Certainly sounds like perfect reading to me. On a hot summer day, I like to read a book set in a cool location---maybe Alaska or the Pacific Northwest in the winter. Hi Celia - Edna says thanks :-) Cathy thanks you for commenting, and agrees that sometimes a snack is a good replacement for a full meal (reading-wise) during the hot summer months, when concentration seems challenged by the heat. Sounds good. I enjoy a short read. A new to me author! Love finding them and this book sounds great!